Tumulus at Soho Theatre Limited run tickets available now! Christopher Adams' drug-fuelled, chemsex murder mystery transfers to London's Soho Theatre following its sold-out run at Vault Festival 2018. 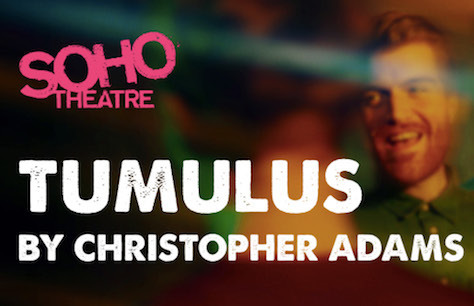 This extremely limited run has less than 20 performances so you'll need to book your Tumulus tickets sharp to make sure you catch this mile a minute mystery as it tears across the Soho stage. This tooth-grinding, nail-biting, heart-pounding hour long whirlwind will have you short of breath and on the edge of your seat. Anthony is a librarian by day and deep into the party and play chemsex culture by night. When a one-night stand of his is found dead on Hampstead Heath everyone assumes he is just another casualty of London’s high-risk chemsex culture. But after a second body is discovered, Anthony can't shake the feeling that there is foul play at work and he rushes off on a frenetic journey to discover the truth. Christopher Adams is a British-American playwright whose works have been performed in London, Birmingham, Dublin, and Shanghai. He has been a member of the Royal Court Theatre’s Young Writers Programme and Studio Writers Group as well as the Arcola Theatre’s writing group and the Orange Tree Collective. His works include Lynchburg, Haunts and an adaptation of Antigone which toured with the Actors of Dionysus. His newest work Tumulus has been labelled a queer noir and was granted an Origins Award for Outstanding New Work at the Vault Festival 2108. Tickets for Tumulus will be available for 4 weeks only. Do not miss your opportunity to catch this incredible show as it comes to London's Soho Theatre for an extremely limited run. Book Tumulus tickets now to ensure the best seats at the best prices and guarantee you won't miss out on this tremendous show.